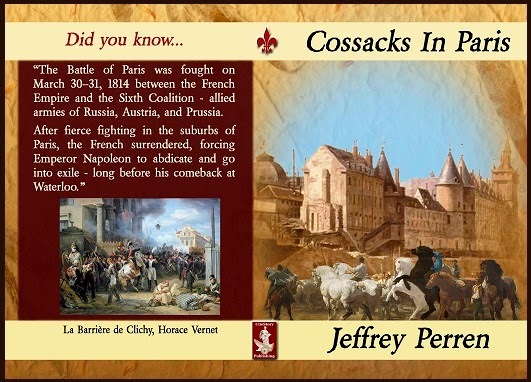 The giveaway for a free, autographed copy of Cossacks In Paris, runs from March 30, 2014 to April 20, 2014. The Battle of Paris began on March 30, 1814 and, after abdicating, Napoleon left France for exile on the island of Elba on April 20th. It would be more than nine months before his return, which began the 100 days leading up to his final defeat at the famed Battle of Waterloo. “Rebellious engineer Breutier Armande is drafted into Napoleon’s Grande Armeé on the eve of the 1812 Russian campaign. On a spying mission to St. Petersburg he meets Kaarina, daughter of the counselor to Tsar Alexander I. The pair soon fall in love — but Kaarina is betrothed to Agripin, a brooding Cossack and a favorite of the Tsar. When she refuses him, Agripin kidnaps her, sowing a showdown to the death between the two young men.